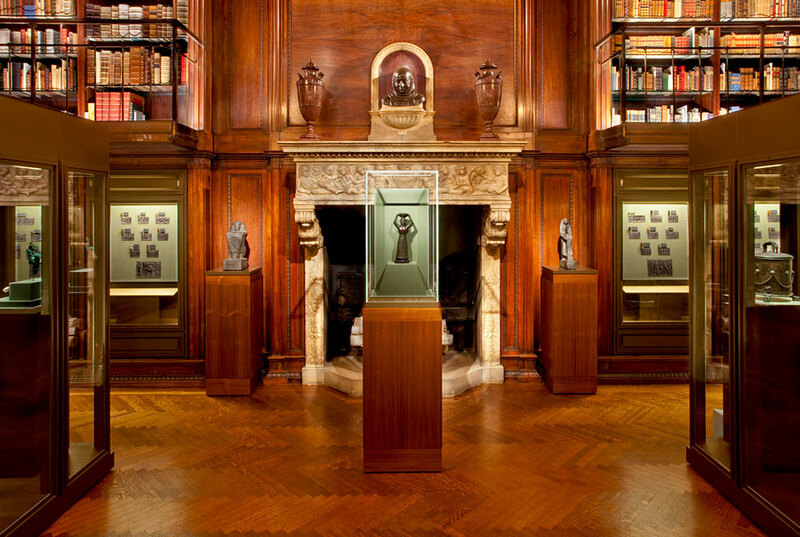 During the interior restoration of J. Pierpont Morgan’s Library in 2010, the North Room of the building was converted into a gallery designed to show a wide selection of Morgan's collection of antiquities, featuring ancient Near Eastern seals and tablets, Greek and Roman objects acquired by Morgan, and the Thaw Collection of early medieval objects of personal adornment. The small-scale, delicately carved seals are shown next to impressions rolled out in gray plasticine as well as enlarged photographs of the impressions that reveal the wealth of detail on these exquisitely carved stones. Four ancient Near Eastern clay tablets, containing text written in cuneiform, including the earliest known flood narrative, are also on display. The Thaw Collection of objects created in Europe, Central Asia, and the Middle East between 300 and 1,000 A.D. is shown in its entirety for the first time. These jeweled pieces are similar to those collected by Morgan himself and provide a link between antiquity and the early medieval world.